The subspecies cinnamomeus of W. Ecuador and NW. Peru may deserve recognition as a separate species from F. leucopus (Ridgely & Tudor 1994) and was treated as such by Parker & Carr (1992) and Ridgely & Greenfield (2001). 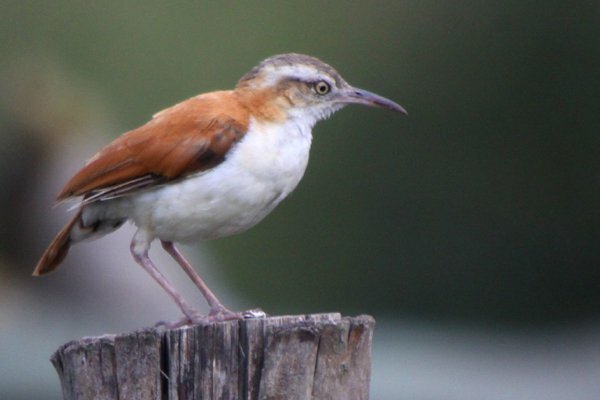 The subspecies longirostris was also treated as a separate species by Ridgely & Greenfield (2001) and Hilty (2003). Although vocal and behavioral differences have been reported, no real analysis has been published to support these splits. SACC proposal to elevate cinnamomeus to species rank did not pass because of insufficient published data. Interestingly, the decision not to split cinnamomeus was not unanimous, and was, in fact, a close 5-3 vote. Clicking on the link from the block quote above will allow you to see not only the proposal, submitted by Van Remson, but also the justifications for the different committee members’ votes on the proposal. The background information offered by Van Remson in his proposal (which he actually voted against) is fascinating, at least to me, and is quoted in full below. For most of their history, the taxon cinnamomeus has been treated as s subspecies of Furnarius leucopus (Pale-legged Hornero). They are allopatric (nearly parapatric) taxa with no known contact zone; cinnamomeus is endemic to the Marañon valley and western Peru and Ecuador, whereas leucopus is found east of the Andes. No published data exist on characters directly relevant to assessing potential interbreeding such as vocalizations; voices are described as being different, but analysis has not been published. The difference in iris color (pale in cinnamomeus, dark in leucopus) has potential as an isolating mechanism. They are 100% diagnosable phenotypic units based on plumage characters. The primary differences in plumage are (apparent) degree of pigment saturation, with cinnamomeus paler ventrally and duller, darker dorsally. There are no pattern differences. Cinnamomeus is significantly larger in body size. In my opinion, qualitatively, the plumage differences are less than those among the subspecies of F. rufus, and the difference in body size is substantially less. Cinnamomeus also differs less in plumage from leucopus than do sympatric F. leucopus and F. torridus. Cory & Hellmayr (1925), Peters (1951), Meyer de Schauensee (1966, 1970), Vaurie (1980), and Sibley & Monroe (1990) treated them as conspecific. Parker & Carr (1992) treated them as separate species but I cannot find a discussion of the problem therein. Ridgely & Tudor (1994) continued to consider them conspecific, but noted that cinnamomeus and perhaps isolated longirostris of N Colombia and NW Venezuela may represent separate species. Ridgely & Greenfield (2001) recognized cinnamomeus as separate species. Hilty (2003) treated longirostris and cinnamomeus as separate species. Remsen (2003) maintained them as conspecific but noted that cinnamomeus almost certainly deserved species rank. So the iris of cinnamomeus, as you can see from my photos,** is pale as opposed to the dark iris of the rest of the Pale-legged Hornero subspecies, cinnamomeus is also slightly larger, and lighter below and darker above. Vocalizations differ, but how they differ has never been published, and, in fact, it seems that there is a near total dearth of papers that deal with the potential split, which seems to be the main reason that SACC rejected it. Any graduate students out there looking for a project? It appears that the scientific world has not yet caught up with the conventional wisdom of the world of birders in splitting the Pale-legged Hornero in at least two. The IOC and the AOU’s SACC have taken different approaches, with the IOC more forward-leaning and the AOU’s SACC more conservative, as normally seems to be the case. I can understand the arguments on both sides, but, like with the Green Jay / Inca Jay issue I looked at previously, it seems that AOU’s SACC likes leaving birds lumped, even if the evidence for a species being lumped is as limited or more limited then the existing evidence for a split. *** Then again, the opinions of checklist committees are perhaps not as valuable as the opinions of field guide authors, and in that respect, as with the IOC, the split has already occurred. 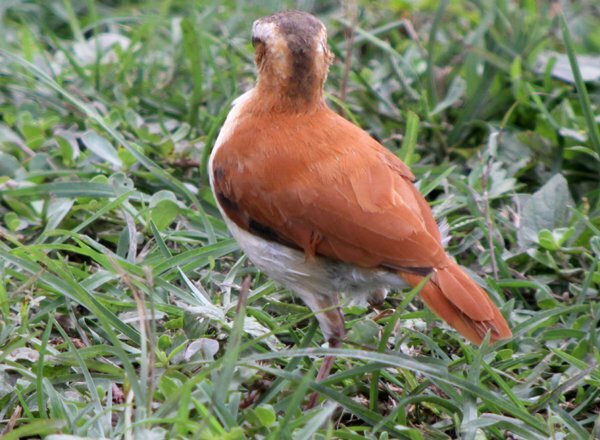 **All photos in this post are of Pacific Hornero Furnarius cinnamomeus and were taken in Ecuador in November 2010. ***And I would like again to emphasize that I am far from being competent to pass judgement on any of the far-more-knowledgeable-than-I people that populate the various and sundry committees that make checklist decisions. Seriously, I don’t know diddly. Hmmm, I see we don’t split the species on Wikipedia, although we do note it is sometimes divided. Personally, I think the SACC’s position of holding back until someone has done some research is fine (so long as there aren’t conservation reasons to worry about them). What it comes down to is that SACC hate field guide taxonomy decissions, where there is no scientific peer reviewed paper that back up the statements. There is still a possibility that the two forms meet somewhere where the dry scrub converts to humid forest in the Marañon somewhere north of Bagua – and as far as I know nothing is known what happens here. Having said that it is likely that any hybrid zone is narrow, since the forms are so distinct – and consequently recognising the two as seperate species should be a no-brainer with the current information available. But SACC needs it to be published and peer reviewed. It is sad that SACC does not publish their summeries – and then they could have a new vote! Birders should stop follow Clements and AOU which are too conservative. What it comes down to for birders is that the forms can be identified in the field. Why ABA follows AOU is a mystery to me. The don’t have to. And it does not serve the birders nor conservation. We have the forms of Pale-tailed Canastero in Peru, that because of lack of peer reviewed papers they were re-lumped. 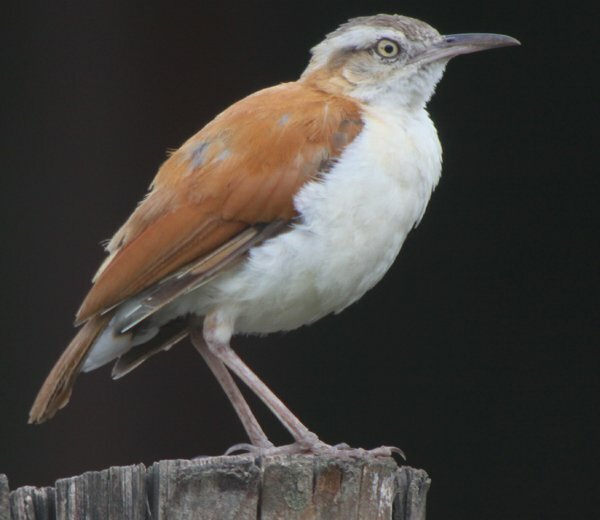 Consequently, Birdlife knocked off the threatened forms from the list of threatened birds (systematic revisions) in spite everyone within SACC agrees there are more than one species involved – just not published yet. @Gunnar – Thanks Gunnar, it’s really great getting insight from someone who knows these birds and sees them regularly. Cheers. Well, since I only have seen members of the amazonian population (the “real” Pale-legged Hornero), I don’t have to worry about adding or not another species to my list… but I agree with Gunnar, probably these committees’ approaches are too conservative, affecting isolated taxas that are threatened by habitat fragmentation. Thanks all around for sharing insights from the field. I concur that the IOC list is more dynamic and responsive to new understanding of species delineations. Plus, more birds mean more fun, right? And how did you get such great shots of horneros? They wouldn’t sit still for me. Thanks, everyone, for your two cents. And, Mike, I just said “Here hornero! Come here hornero!” and they came right in. I can’t believe you didn’t think to try that. I am traveling through South America right now and have just encountered my first ever Pacific Horneros today. Several years ago I saw Pale-legged (the nominate form anyway) in SE Peru, and even with my questionable memory I noticed right away how much paler the Pacific is. Of course, we’re just talking eyeballing the differences in forms as opposed to comparing the totality of differences between them. In any case, that’s what brought me to your page, when I saw that despite the guidebooks’ treatments, the AOU is waiting for scientific publication to move along. To respond to Gunnar’s proposal, I do think birders should follow the AOU, or at least some kind of peer-reviewed, scientifically-oriented organization. Otherwise, what exactly are you following if not science? Yes, science is slow (well, committees are anyway). But I don’t want to see a world where the ABA decides that the AOU is bunk because they don’t split species fast enough and that people should be allowed to count zoo animals or subspecies or even birds with leucistic plumages as new species for their lists. Because frankly, that’s what this discussion really boils down to – what is our lingua franca when it comes to seeing and discussing the birds in our world? How can we all get on the same page, or at least get closer to it? That all said, I do expect that eventually the Pacific will be split off from the Pale-legged. I’m happy to put that bird in my pocket for now and simply know that I’ve seen both forms and feel comfortable knowing which is which. Last year’s 3-way split of the Winter Wren gave me 2 new lifers without having to lift a finger – I can be patient and wait for this one too. @Eric: Thanks for your comment and your perspective on the issue. Hopefully someday I’ll get to see the nominate form too! Eric asked: What are you following and what is the lingua franca? I see a future where birders as a community decides what is countable lor not? With social connections birders have on the Internet today it should be quite possible. I have put together a new master list containing some 14000 identifiable forms. When this is uploaded as a database on line, birders will be able to discuss what should be countable or not and could reach a consensus just as easily as SACC does today. Only that the important issue is whether the forms are distinctive enough to be countable. Birders are interested in separating one form from the other. Separating forms of gulls (some not yet recognized ) makes the birder a better birder. Do you know if Pacific Hornero fledglings are black in color? 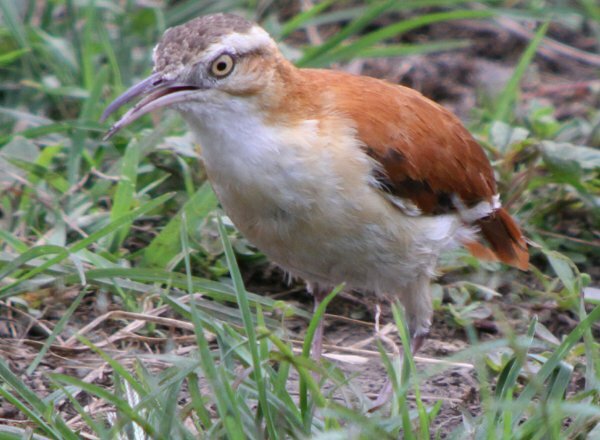 I can see an hornero nest from my front porch and have watched two horneros build the nest and tend to it for the last several months. I have seen a black colored bird step in and out of the nest several times with the horneros sitting on the limb beside the nest obviously aware and permissive. The black bird is about the same size as the horneros, but has none of the normal coloring. Where Are You Birding This First Weekend of October 2015?